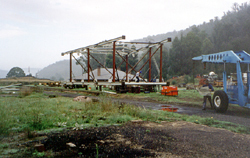 From virtually a pile of scrap steel on the ground the ex-Newstan Colliery was completely re-erected over the downcast shaft at the Lithgow State Mine site by Lithgow Valley Engineering. 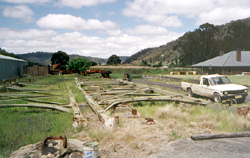 Funding for this project was provided by the Miners Trust Fund. 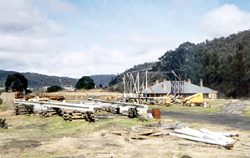 Steel sections laid out on the ground. The sides were refabricated in a horizontal position. Refabricated framework and bracing leg waiting for a final coat of paint. 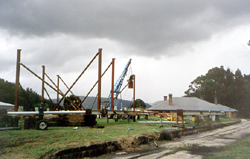 With the main part of the frame erected the head was hoisted into position. The bracing leg is fixed into position.